Folders are nodes in the Cloud Platform Resource Hierarchy. A folder can contain projects, other folders, or a combination of both. Organizations can use folders to group projects under the organization node in a hierarchy. For example, your organization might contain multiple departments, each with its own set of GCP resources. Folders allow you to group these resources on a per-department basis. Folders are used to group resources that share common IAM policies. While a folder can contain multiple folders or resources, a given folder or resource can have exactly one parent. In the diagram below, the organization, "Company", has folders representing two departments, "Dept X" and "Dept Y", and a folder, "Shared Infrastructure", for items that might be common to both departments. Under "Dept Y", they have organized into two teams, and within the team folders, they further organize by products. The folder for "Product 1" further contains three projects, each with the resources needed for the project. This provides them with a high degree of flexibility in assigning IAM policies an Organization policies at the right level of granularity. You can use folder-level IAM policies to control access to the resources the folder contains. For example, if a user is granted the Compute Instance Admin role on a folder, that user has the Compute Instance Admin role for all of the projects in the folder. Folder functionality is only available to G Suite and Cloud Identity customers that have an organization resource. For more information about acquiring an organization resource, see Creating and managing organizations. Review Access Control for Folders Using IAM. The topic describes how you can control who has what access to folders and the resources they contain. Understand how to set folder permissions. Folders support a number of different IAM roles. 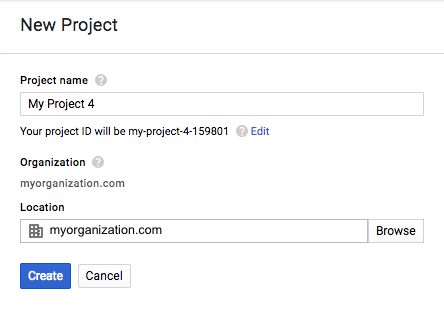 If you want to broadly set up permissions so users can see the structure of their projects, grant the entire domain the Organization Viewer and Folder Viewer roles at the organization level. To restrict visibility to branches of your folder hierarchy, grant the Folder Viewer role on the folder or folders you want users to see. Create folders. As you plan how to organize your Cloud resources, we recommend that you start with a single folder as a sandbox where you can experiment with which hierarchy makes the most sense for your organization. Think of folders in terms of isolation boundaries between resources and attach points for access and configuration policies. 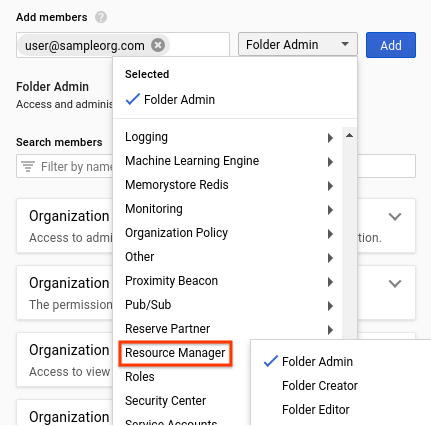 You may choose to create folders to contain resources that belong to different departments and assign Admin roles on folders to delegate administrator privilege. Folders can also be used to group resources that belong to applications or different environments, such as development, production, test. Use nested folders to model these different scenarios. You can nest folders up to four levels deep. A parent folder cannot contain more than 100 folders. This refers to direct child folders only. Those child folders can, in turn, contain additional folders or projects. Folder display names must be unique within the same level of the hierarchy. 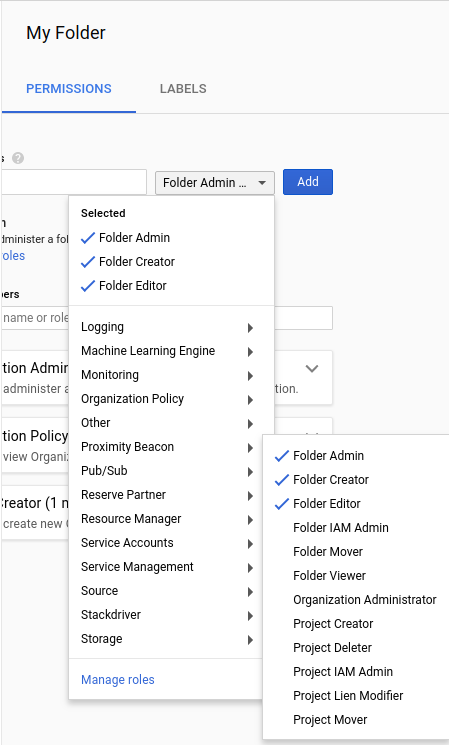 To access and manage folders, you need to assign folder-specific IAM roles to specific groups of users. To learn more about these roles, see Access Control for Folders using IAM. We also recommend you review our best practices to help you identify the optimal configuration for your folder permissions. Tip: To manage folders for your entire Organization, you need the Folder Admin role. This role grants the user permission to create, edit, delete, move, and change IAM permissions on folders, as well as permission to move projects between folders. Initially, only the Organization Admin can assign the Folder Admin role for the Organization. Subsequent accounts that are assigned this role can grant it to other accounts. In the Google Cloud Platform Console, open the Manage resources page. Click the Organization drop-down list in the upper left and then select your Organization from the list of resources. In the Add members text box on the right, enter your email address. In the Select a role drop-down list box, go to the Resource Manager category, and select the Folder Admin role. Click Add to grant the new role. [ORGANIZATION_NAME] is the name of the org whose IAM policy is being set, for example organizations/123. To create folders, you must have the Folder Admin or Folder Creator role at the parent level. For example, to create folders at the Organization level, you must have one of these roles at the Organization level. The name may contain letters, digits, spaces, hyphens and underscores. The folder's display name must start and end with a letter or digit. The name must be 30 characters or less. The name must be distinct from all other folders that share its parent. Folders can be created in the UI using the "Manage Projects and Folders" section. In the Folder name box, enter your new folder's name. Under Destination, click Browse, then select the organization node or folder under which you want to create your new folder. Folders can be created programmatically using the gcloud command-line tool. To create a folder under the Organization resource using the gcloud command-line tool, run the following command. [DISPLAY_NAME] is the folder's display name. No two folders with the same parent can share a display name. The display name must start and end with a letter or digit, may contain letters, digits, spaces, hyphens and underscores, and can be no longer than 30 characters. [ORGANIZATION_ID]is the ID of the parent Organization if the parent is an Organization. [FOLDER_ID] is the ID of the parent folder, if the parent is a folder. Folders can be created with an API request. [DISPLAY_NAME] is the new folder's display name, for example "My Awesome Folder." [ORGANIZATION_NAME] is the name of the organization under which you're creating the folder, for example organizations/123. To configure access to folders, you must have the Folder IAM Administrator or Folder Admin role at the parent level. Click the Organization drop-down list in the upper left and then select your organization. Select the checkbox next to the project for which you want to change permissions. In the Select a role drop-down list, select the role you want to grant to those members. Click Add. A notification appears to confirm the addition or update of the members' new role. You can configure access to Folders programmatically using the gcloud command-line tool or the API. [FOLDER_ID] is the new folder's ID. [POLICY_FILE] is the path to a policy file for the folder. SetsIamPolicy sets the access control policy on a folder, replacing any existing policy. The resource field should be the folder's resource name, for example, folders/1234. [FOLDER_NAME] is the name of the folder whose IAM policy is being set, for example folders/123. To create a project in a folder, you must have the Project Creator role (roles/resourcemanager.projectCreator) on the folder. This role may be inherited from a parent folder. In the Google Cloud Platform Console, open the Manage Projects and Folders page. Go to the Manage Projects and Folders page. Select your organization from the Organization drop-down on the top left of the page. In the Destination box, click Browse to select the folder under which you want to create the project. [PROJECT_ID] is the ID of the project ID to create. [FOLDER_ID] is the ID of the folder in which the project should be created. [PROJECT_ID] is id of the project being created, for e.g., my-awesome-proj-123. [DISPLAY_NAME] is the display name of the project being created. Have the resourcemanager.projects.update permission on the project, which typically comes from having either the Project Editor or Project Owner roles on the project. Have the resourcemanager.projects.move permission on both the source folder and the destination folder. This permission is typically part of the Project Owner, Project Editor, Folder Admin, or Folder Mover roles. If the resource is not in a folder, you will need this permission on the organization node. Click on your project's row to select your project from the list of projects and folders. Note that you must not click on the name of the project, which takes you to the project's IAM page. Click on the options menu (the vertical ellipsis) in the row and click Move. Click Browse to select the folder to which you want to move the project. [PROJECT_ID] is the ID of the project ID to move. Important: It is your responsibility to make sure that all the necessary permissions and policies are defined at the source and destination folders. You must carefully consider any policy implications before you move a project into or out of a folder because IAM policies that you define at the project level automatically move with the project, but policies that you define at the source or destination parent level do not. This means that any users who had inherited access to the project may lose that access if the destination folder does not have the same policy. In addition, changes in IAM roles could cause some functionality to stop working until the proper permissions are reinstated. For example, consider a service account has Storage Object Creator associated at Folder A. This folder has the appropriate permissions to upload data to Google Cloud Storage in any project in Folder A. Now, consider what happens when one of these projects moves to Folder B, which does not have the same permissions. The service account for that project loses the ability to upload data, resulting in a service outage. These same considerations apply if Organization policies are defined at the source and destination folders. Like IAM policies, Organization policies are inherited. Consequently, you must ensure that your Organization policies are consistent between source and destination folders. To learn more about Organization policies, see Introduction to the Organization Policy Service. To move a folder into another folder, you must have the Folder Mover role for both the source and destination folders. The process of moving folders into other folders in the console is similar to moving projects. Click on your folder's row to select your folder from the list of projects and folders. Click Browse to select the folder to which you want to move the folder. [FOLDER_ID] is the ID of the folder to move. [PARENT_ID] is the Organization ID or the folder ID of the parent Organization or folder. [DESTINATION_FOLDER_ID] is the ID of the folder under which you're moving another folder, for example 98765. [DISPLAY_NAME] is the display name of the folder being moved, for example "My Awesome Folder." To view or list folders, you must have the Organization Viewer and Folder Viewer roles. Select your Organization from the Organization drop-down on the top left of the page. All projects and folders under the Organization are displayed on the page. Note that folders must be created before they will appear in this list. Select any row in the tree to perform folder- or project-specific operations. Note: the options menu (the vertical ellipsis) on the right column displays options for supported operations. Enter the project or folder name/ID in the search to filter the list. To view a folder, use the describe command. [FOLDER_ID] is the ID of the folder you want to view. To list the folders under an organization, use the list command. [ORGANIZATION_ID] is the ID of the organization for which you want to see a list of child folders. The command outputs a table that displays the child folders of the organization ID you specified. The list command can also list the folders under another folder, using the --folder flag. [FOLDER_ID] is the ID of the folder for which you want to see a list of child folders. To list the projects under an organization or folder, use the projects list command and the filter argument. [FOLDER_OR_ORGANIZATION_ID] is the ID of the folder or the organization for which you want to see a list of child projects. [FOLDER_NAME] is the name of the folder, for example folders/123. [PARENT_NAME] is the name of the parent resource under which you’re creating the folder, such as organizations/123 or folders/123. Commands for interacting with the Folders API with the gcloud command-line tool are available in the gcloud alpha resource-manager folders command group. To create a new folder, use gcloud alpha resource-manager folders create with flags setting the name of the folder and the ID of the Organization or folder in which you'd like it created. To view a folder, use gcloud alpha resource-manager folders describe with the ID of the folder you wish to view. To list the folders underneath a folder, use gcloud alpha resource-manager folders list, passing the folder ID in the --folder flag. This can also list the top-level folders under an Organization, using the --organization flag. You can list projects using the gcloud alpha projects list command, passing the parent folder or organization ID in the --filter flag. Folders can be updated with the gcloud alpha resource-manager folders update command. Currently, only the display_name field of a folder can be updated. Folders can be deleted and undeleted from the command line. A user must possess either the Folder Admin or the Folder Editor role to have the permission to delete a folder. You can only delete a folder if it is empty. Projects can be created in folders and moved into folders using the existing gcloud projects create and gcloud projects move commands. Folders can also be moved, using gcloud alpha resource-manager folders move. Some folder operations such as creating folders can take a long time. To make it easier to multitask, some folder commands allow you to perform them asynchronously. These commands accept an --async flag to enable asynchronous behavior, causing them to return a Long-Running Operation immediately instead of waiting for the operation to complete. You can poll this operation yourself with the gcloud alpha resource-manager operations describe command. Currently, only the folders create and folders move commands allow asynchronous use.